Dr. Nathan R. Etten. O.D. 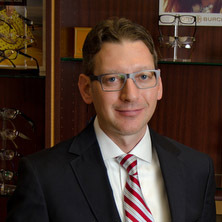 Dr. Nathan Etten earned his Doctorate of Optometry from the Illinois College of Optometry in 1997, after completing externships at Illinois Masonic Medical Center and the Illinois Eye Institute. After 2 years of practice in New Orleans, Louisiana, Dr. Etten earned his Florida Board certification and relocated to Miami in October 1999. A native of Wausau, Wisconsin, Dr. Etten received his Bachelor of Science from Florida State University.